To access this page, in the PROJECT section of the ADMIN module, on the list the shows the available groups of settings, click EXPORT. On this page, you can export the data of the current project as a .json file. To export the data of the current project, click EXPORT. If your project is hosted on tree.taiga.io or on an asynchronously configured Taiga installation, when the .json dump file is ready, you will receive an e-mail from where you can download the exported file. 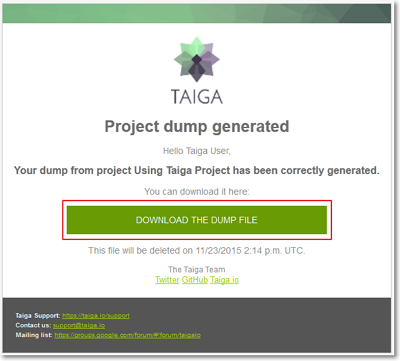 If your project is hosted on a synchronously configured Taiga installation, the .json dump file is downloaded automatically when ready. You can use the exported .json file to import the project in Taiga if needed. For more details about importing a project, you can go to Importing a project.